I missed earlier this month, but it's coming around again in July: Buy A Friend A Book Week will be back for the first week in July, as one of its four annual occurrences. The simplest projects can be the best — find somebody you'd call a friend, and buy them a book. No strings attached, no reporting requirements, just buy a book. Via Kitsch-Slapped. Library cats are, by far, the best animal in the world to own. Need to get some research done? 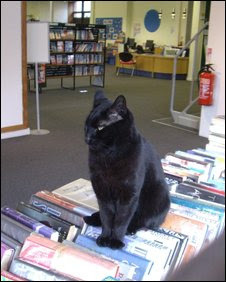 Send the cat down to the library to look it up for you. Past-due books? Tie them to his back. Fidel, on the right, stops in to his public library daily after his owners let him out in the morning. They go to work, he goes to the library, and when his owners get home Fidel checks out his books, pushes in his chair, and goes home for the night. Here in the U.S., libraries have to buy their own kitties, sadly. Via. 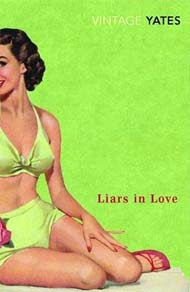 Richard Yates wrote from the viewpoint of the post-war, pre-Baby-Boomer set, set upon by the modern world while dealing with their own fractured lives, and what could be more fitting than covers done in the style of those tempting and beautiful "modern world" advertisements and images that identify with the world Yates' characters struggled against? Despite the very retro style of the graphics, the design is ultimately modern, reducing the focus of the original design, setting the image off-center of what is really going on and surrounding with a lot of empty space, symbolizing Yates moreso. 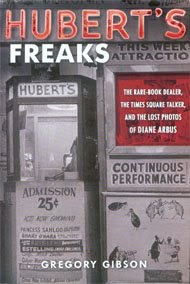 Over at Collector's Quest, I review Hubert's Freaks, a tale of an antiquarian book dealer who stumbles into a lost artifact of the art world: A series of Diane Arbus photos of Hubert's Museum. Ultimately, everyone in the book is struggling with their own personal demons, but Bob Langmuir, the protagonist antiques dealer, is the only one to come out ahead in the end. After reviewing The Error World, the media guy at Harcourt thought this book would be a good fit for me to review, andsent it to me just in time for the paperback release through fellow Houghton-Mifflin imprint Mariner. 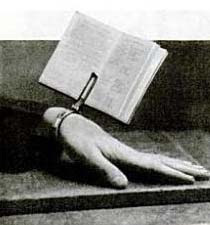 Need a way to hold a book, while ensuring you can't use both of your hands? Try the 1930 Popular Mechanics solution for supporting a tiny book. With the book clipped, it would be a bit of a chore to turn the pages, requiring both hands, but I suppose specialized people could have a use for such things, needing to use the right hand for something else while having no place to set their booklet. Joe Orton and Kenneth Halliwell were artists, friends, and lovers, with a sense of artistic boredom that led them to the library. "Libraries might as well not exist; they've got endless shelves for rubbish and hardly any space for good books." Orton, 1967. The pair were sentences to 6 months in prison for altering and defacing library books to entertaining ends. Somebody, probably originally for the sake of evidence, saved the altered covers. 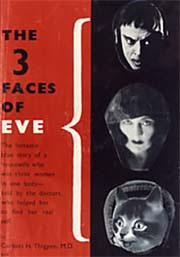 Orton and Halliwell got nationwide media attention due to the story of their arrest, entitled Gorilla in the Roses, after this altered cover. For as huge and amazingly efficient as Amazon is, there's no robotic connection to getting your purchases into a box and shipped out. 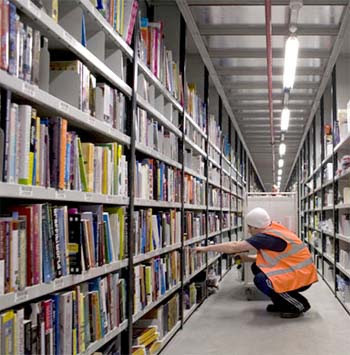 People in high-visibility vests walk the aisles, pulling books and putting them on carts — and how those employees are handled is the source of Amazon's efficiency, not some technological shoehorn. 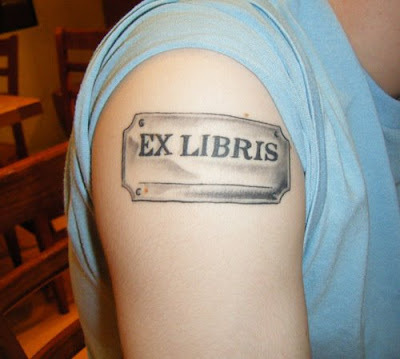 Note that the owner of the tattoo left the name blank, in case it needs to change in the near future.